Life can be beautiful, life can be hard. I choose a colorful one and it starts in my nest…every day I have the opportunity to make it better. How do I eventually triumph over these frequent relocations? The trick to making your furniture work, when you move as often as we do, is to keep it neutral. Yes, neutrals play it safe most of the time, however, if you have flexibility with wall color go for a splash of a bright and beautiful hue. Since we don’t have that option either, we resort to layering up the rooms with vibrant and dramatic colors—playful patterns and various textures…all are welcomed. It’s more economical and efficient to invest in throws, pillows, and objects d’art to flatter your rooms by adding those vital layers that create a playful contrast. 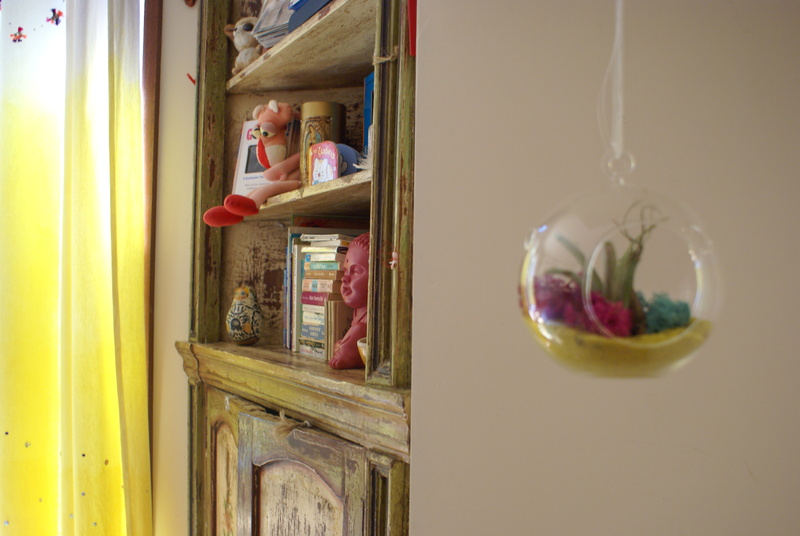 I seized a unique prospect of a quirky corner to dangle a clear sphere with wistfully selected aqua (reminds me of the sea), cerise (livens up feelings of cherries and summer hazy days) and brilliant yellow (ever so cheery) grains of sand. In Feng Shui, yellow is an earth element color (the earth element is needed to maintain health and inner balance as well as creating stability, nourishment and calm protection for all your relationships) when combined with earth tones it may generate an environment flowing with well-being. 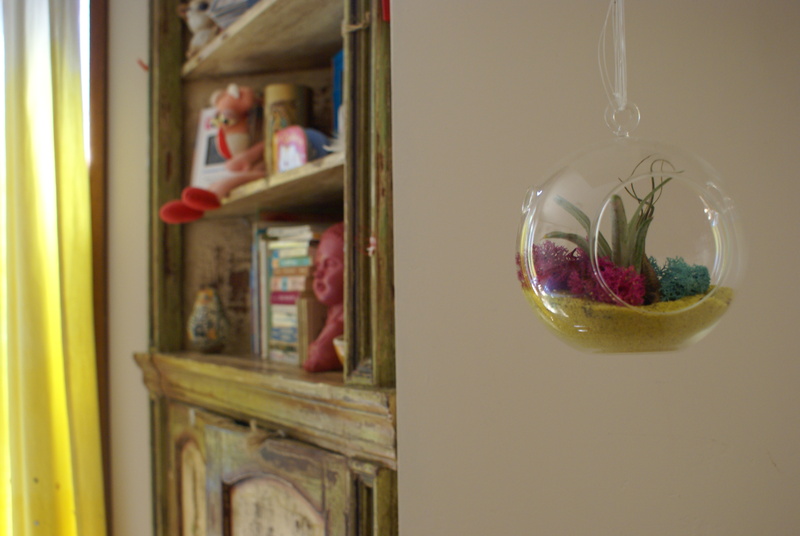 The early morning light shines on this mini ecosphere for just the right amount of time and it’s something to gaze at while baby bear dozes off for some z’s. 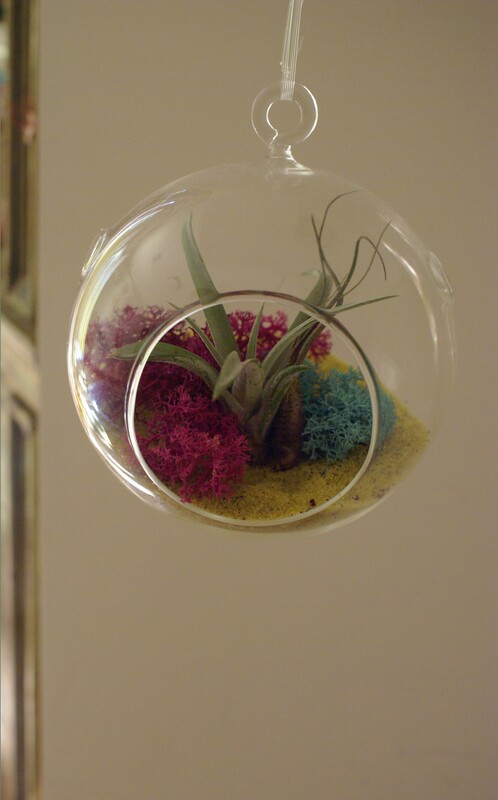 A low maintenance air plant to clear the air while building on the effects of layering texture and adding a wood element for growth and vitality, was a must. How do you add color to your life? Does your nest reflect this? Cheers to having the opportunity to make things better! Thank you. Your novel is already of interest to me because of the food industry and now I’m intrigued by your character’s taste. Now I have another reason to read it! Poor kiddo, I already feel for him. Lots of luck with it! Writing was the easy part, non? Now it’s showtime! Love the hanging thingy…is that a real plant? 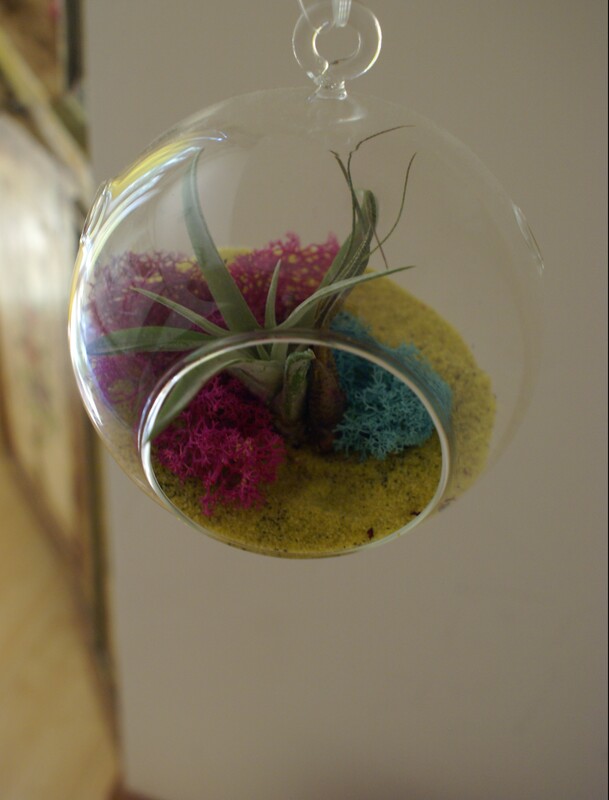 Thank you, yes the glass sphere is cradling real sand, moss and a couple of air plants. I take the plant out weekly for a two hour soak in water and then it’s back to its cradle with a few rays of light during the day. I like vibrant colors too! We just moved few weeks ago and we experimented with different colors in every room.It turns out great and we love it! Super, enjoy your new nest and its vibrancy!